Ex-CEO of Symantec Enrique Salem explains his viewpoint on the concept of “digital natives” at RSA Conference, and provides his vision of IT security’s future. Thank you and good morning. I have somewhat of a unique vantage point as the CEO of the world’s largest security company. And there’s an unstoppable force coming this way. And it’s already hitting the security industry like a sledgehammer. It’s not a new virus, it’s not malware, it’s not an application; it’s not software at all. It’s not a new device, and it’s not a new form of cybercrime. It’s her and it’s him, and him, and him, and her. It’s this large group of young people that we call the “digital native generation”. They have a different way of doing things in this digital age. It’s how they work, it’s how they think, it’s how they interact. And they’re completely changing how we think about work and business and security. I’m constantly amazed at how this generation collaborates and solves problems. If you know any teenagers today, you already know what I’m talking about. They don’t rely on search queries the way we do. They don’t rely on a single source of information like books, or articles, or websites. They get their answers on YouTube, from their networks or posts. They reach out across their networks to find answers or collaborate on a solution, and in doing that they often find faster, more effective ways to get things done. This generation will absolutely impact how we do business, how we collaborate. And it’s not 10 years off, it’s not 5 years off; it’s happening right now, it’s impacting us today. So we must understand this new generation and we must build a world that works for them. But before we go much further, I want to paint a clear picture of what I mean by “digital native” – how they work and how they think. “Digital natives” were typically born in the 1990s, and they’ve never known a time before the Internet or before smart mobile devices. By the time they’re 21, they will have averaged 250,000 e-mails, IMs and texts; 10,000 hours on their cell phones; 14,500 hours online. And most of the time they’re online, 80% of that time they’re using social networks. Now they’re starting to enter the workforce. And this is how they prefer to work: they’re always networked, they’re always sharing, and they’re always multitasking. But it’s actually beyond multitasking; it’s something that we call “continuous partial attention”, or “CPA”. They’re doing homework, they’re being online, they’re skyping; they’re doing it simultaneously, and they’re redefining multitasking. They’re always mobile. But when I say they’re always connected and they’re always mobile, I don’t mean that they like to spend a lot of time online. I mean that not having their mobile device at their side, not having instant access to the Internet and their social network would be like the previous generation not having their wallet, their ID or their glasses. A mobile device is the tool they use to connect with everything, not just Facebook and Twitter, but everything. 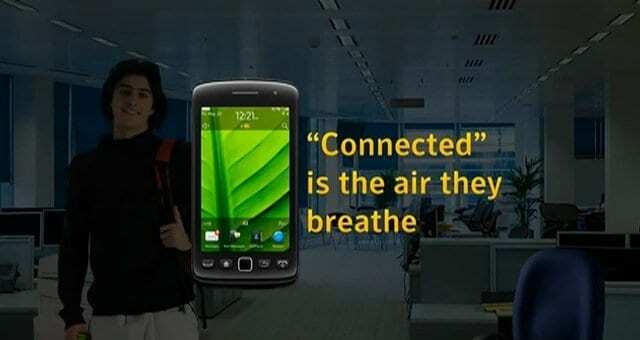 “Connected” is simply the way they live, it’s the air they breathe. Many of us in this room now also feel that way. The inspiration for how we’re going to work tomorrow is coming from today’s digital natives. In fact, we’re already starting to feel that impact. But the digital natives – they’re not like us. We’re different. We’re digital immigrants. We weren’t born into this digital world, we grew into this world. We helped build it, and many of you in this room are charged with securing it. So we have a different perspective on mobile devices. We have a different perspective on connectivity. We tend to be careful about our identity online, not quite trusting the digital world to always have our best interest in mind. Now let me tell you and describe this a little further. Digital natives don’t use landlines, they don’t use pagers, they don’t use postage stamps. While we might still look for a restaurant review or a movie review in a publication, a printed one potentially, they rely on their social network. While we complain about our inboxes being crowded, a digital native might not even have one, and if they do, they rarely check it. So e-mail will change. While we might remember games like “Pong” and “Space Invaders”, and “Missile Command”, and lots of other early videogames, a digital native thinks nothing about picking up a controller and in real time playing a game across the world with somebody they don’t even know. So we’ve talked about the world being flat; I don’t think we’ve seen the true definition of that. They don’t know the meaning of the word “reboot” because they probably never had to. And here’s another difference. The digital immigrants came to work with the Internet at work – that’s where most of us got introduced to the Internet. We bought it home and eventually got connected. To digital natives there’s no distinction between the Internet at work and the Internet at home. So, while there is a tremendous benefit to all of these connections, there’s also a greater set of vulnerabilities. Most digital natives don’t think about identity and security the way we do. Their connections are free and open, and that’s how they like it. That’s the world they work in. When first digital native took his or her first job, the world had already started to change. If you ask a digital native about security in the cloud, they might actually tell you that’s a foolish question. The most important thing about what’s happening around the digital native generation is they’re going to change how we do business. They’re already accelerating this notion of the consumerization of IT. They’re “bring-your-own-device” by nature. They’re blurring the lines between business and personal; always connected to work, always connected to the personal life – one individual with many roles and different sets of credentials. So, while the lines start to blur between work and home and everywhere, the digital native is planted firmly in the middle. So it’s important for us to understand that this way of working isn’t just a subset of the way business will be done in the future. This is the future of business. For those of you in this room, this is the freight train of change that’s heading this way and hitting like a sledgehammer. All the ways we conduct business will change. More of it will be in the cloud, both private and public. It’ll all be mobile. It’ll all be connected; well, maybe constantly connected. Because when first digital native took his or her first job, the world had already started to change. 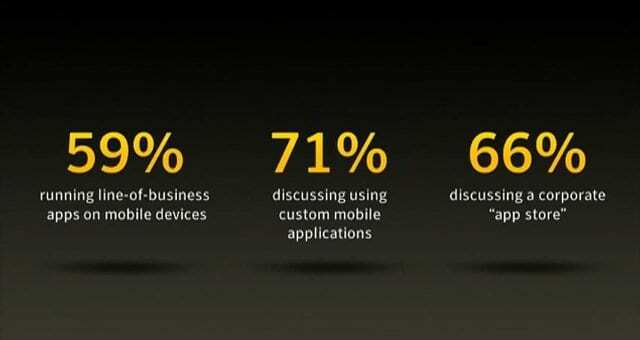 A recent survey that Symantec just conducted showed how real this change is, how being mobile and connected is the real world (see image). 59% of the people in the survey said they’re already running line-of-business applications on their mobile phones. 71% said they are thinking about building custom mobile apps; and 66% said that they are looking at creating a corporate “app store”. Now, as we think about our employees and what they’re doing – they’re going online and using more cloud-based services with or without our approval, and so this change is real. And all of us in this room, we need to work together; we need to lean in and be more aggressive about embracing these changes. Countless times I’ve interacted with people who’ve told me: “I’m worried about how this consumerization thing will go”. The reality is there’s no fighting it. It’s only going to accelerate. We need to get out in front of it, and we need to get ready to protect it.